Carol Welsman is an internationally acclaimed jazz singer. 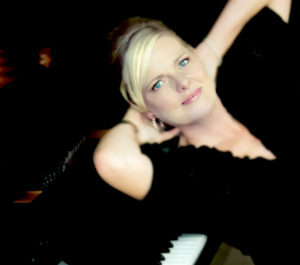 Her album I Like Men – Reflections of Miss Peggy Lee won six Juno (Canadian Grammy) and was among the five best albums of the year 2008 in the US. Within a trio or with a symphony orchestra, Carol Welsman is one of the greatest voices on the jazz scene. Ballads, swing, a beautiful voice and a pianist of great sensitivity, one of the headliners of the 11th edition of the PAPJAZZ. 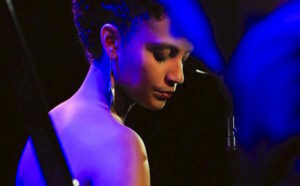 Sarah Elizabeth Charles voice quickly put her on the best stages of New-York jazz, from the Blue Note to Carnegie Hall and Jazz at Lincoln Center. Her musical style is unique and her melodies work as beautifully on standards as on original compositions. Concert after concert, this Haitian-American singer pushes back the limits of her own voice and goes further into exploring new musical frontiers. A voice, a style, an original and hypnotic tone with a soul-jazz and RN’B touch, an enchanting evening! Pianist, composer, educator Panamanian Danilo Pérez is one of the most dynamic and influential musicians of our time. 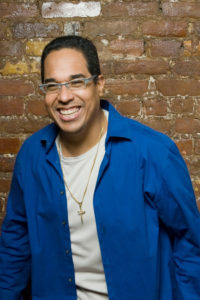 He studied at the National Conservatory of Panama, then joined the Berklee College of Music. He played with Jon Hendricks, Terence Blanchard and Paquito D’Rivera to name just a few, and later collaborated with renowned artists as Dizzy Gillespie, Wayne Shorter to form Shorter’s great quartet with John Patitucci and Brian Blade. He has been nominated several times for the Grammy and Latin Grammy for a good part of his works. In 2015, he released his latest album “Children Of The Light”. Very socially committed, Danilo Pérez, has been a Goodwill Ambassador to UNICEF. He currently serves as UNESCO Artist for Peace, Cultural Ambassador to the Republic of Panama, Founder and Artistic Director of the Panama Jazz Festival, and Artistic Director of the Berklee Global Jazz Institute in Boston’s Berklee College of Music. The PAPJAZZ has the honor to host for this 11th edition a great figure of Latin jazz. 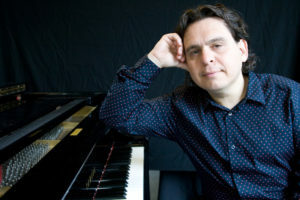 Coming from Amsterdam, pianist Mike del Ferro has performed in more than 100 countries, collaborating with musicians of varied backgrounds and cultures. In 1989, he was awarded the First Prize at the Rotterdam Jazz Piano Competition and the Soloist award at the European Jazz Contest in Brussels. His fame as a solo artist, but also as an arranger and accompanist is firmly established, and he was featured alongside Jack DeJohnette, Toots Thielemans, and in another style, Candy Dulffer. A classical touch for a simple and elegant performance, Mike del Ferro’s style is linked to inspirations from his masters (especially Duke Ellington) and from the cultures he got to know during his numerous trips. He’ll be accompanied by Richard Barbot at the bass guitar and John Bern Thomas at the drums during this eclectic concert. Expression is very important in the works of German pianist Sebastian Schunke, whose international fame for Latin Jazz is firmly established. Thanks to a truly modern style, Sebastian Schunke revisits the style brilliantly and effectively. Constantly experimenting, he created in 2004 a wonderful orchestra with vocals, strings, electric guitar, brass and rhythm sections. With Afro-Latin rhythms, Sebastian Schunke will lead you on his very own a musical path. A blend of charm and grace, Haitian-American singer Vanessa Jacquemin has that little something that keeps her voice in your head for a long time. 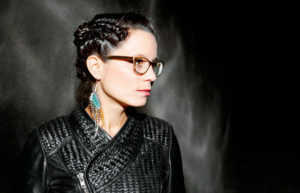 Coming from the Brazilian scene, from which she keeps warm accents, Vanessa was deeply influenced by the Parisian jazz scene, where she was acclaimed for 8 years: Jazz à Marciac, the Battaclan, the Vieilles Charrues… her sound palette encompasses jazz, pop and traditional Haitian musics. A French guitarist with a modern jazz touch, Alex Jacquemin has an eclectic style that has led him to collaborate with bands of different styles: electro-rock (Zend Avesta), Brazilian (Vitto) and world music (Canaïma). Being also a composer and arranger, and after years of collaborations, Alex Jacquemin is the ideal guitarist to enhance Vanessa’s warm voice. 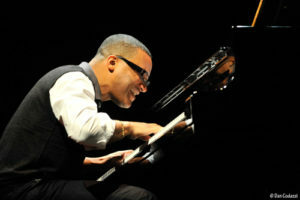 A native of Havana, pianist Gonzálo Rubalcaba is without a doubt one of this Century’s musical geniuses. 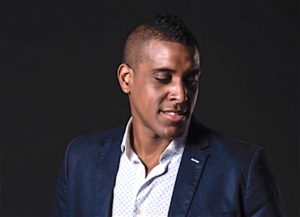 With a virtuosity worthy of Rachmaninov’s, this Cuban performs both jazz standards and original compositions, in which the brilliance of Cuban rhythms is never really far. In 1986, he was playing with the band Grupo Proyecto, the Orquesta Aragon and he was signed by Blue Note Records. Since then, he’s been working either solo, or accompanied by a myriad of artists such as Charlie Haden, Chucho Valdés and even John Patitucci, to name but a few. A First for Haiti. 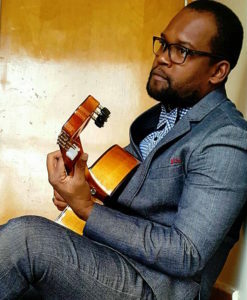 Smith Emmanuel started by playing the classical guitar at the ENARTS (Haïti’s National School of Arts) and then met the one and only Claude Carré who led him to the path of jazz guitar. 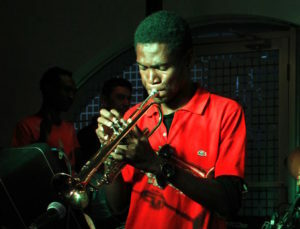 A founding member of Ragou Mizik, Smith Emmanuel performed from 2007 to 2010 at the Presse Café, accompanying, among others, James Germain, BelO and Darline Desca. Every Friday evening, he hones his style at the Kayapipo. His style, a blend of jazz standards and traditional music, is further enhanced by the perfect chemistry he shows with his guitar. 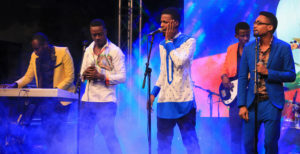 SMS Kreyol, a musical band with four young Haitian musicians, was born during the PaP Jazz 2013! 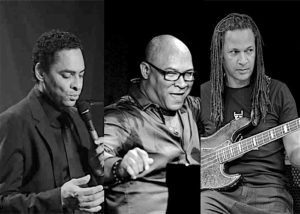 After studying jazz with Claude Carré, those four musicians decided to unite their talents for a workshop at the FOKAL, and created their own style, a blend of compas, smooth jazz and RN’B. 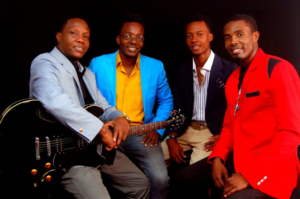 SMS Kreyol, an energetic and promising quartet that blows a wind of youthfulness onto Haitian music! Ever since she was nineteen, Anne Paceo, a drummer without frontiers, has performed in more than 39 countries on 5 continents, with the most famous musicians (Rhoda Scott, Yaron Herman, Alain Jean-Marie…). At 24, she won a Victoire de la Musique (French Grammy) and has issued 4 albums, all of them well received by critics. With pianist Leonardo Montana and double bass player Joan Eche-Puig, Anne Paceo created this trio “Triphase”, a musical story where three beautiful characters are revealed. A great pure jazz evening whose memory is sure to last for a long time! Winner of an Independent Music Award for her first album They Oughta Write a Song (2008), singer Halie Loren revisits with freshness and passion standards such as Quizás, quizás, quizás, In a Sentimental Mood and even A Whiter Shade of Pale. Her album Heart First (2012) shows an artist with an outstanding tonal purity, an exceptional performance feat, and a skill that is increasingly refined. With a repertoire of jazz standards, reinvented pop classics and glittering original compositions, Halie Loren is a must-see concert! The Widmaier brothers have been playing and writing music together ever since they were teens. One is a pianist, composer and arranger, the other is a songwriter-composer, drummer, percussionist and singer. After years of musical explorations between rock, pop, jazz fusion, konpa and traditional Haitian music, they created in 1983 the New Generation style with ZÈKLÈ, which was a revolution in popular Haitian music. ZÈKLÈ issued 5 albums in ten years, performed throughout the country and toured in Europe and the USA. At the same time, Mushy accompanied by Joël invented a format that leaned more toward Kreol Jazz in LAKANSYEL. 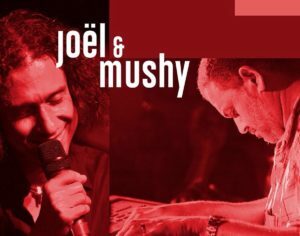 Now, the Widmaier brothers have a new sound that combines Joël’s pop tendency with Mushy’s Kreol Jazz style ; the promise of an intense and exhilarating evening. A Swiss singer and violinist, Yilian Canizares takes from her Cuban roots both a sense of rhythm and a tremendous energy! She delves through Chopin’s Nocturnes, the sounds of Chucho Valdéz, and the daring of Santeria ceremonies. Nothing is weak in her music, everything is urgent, compelling and perfectly managed. 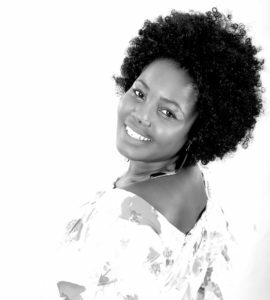 And the fluid nature of Yilian Canizares will make a lasting impression on the Haitian public. Jean-Paul Estiévenart’s curiosity and openness make of him a musician that is constantly searching. 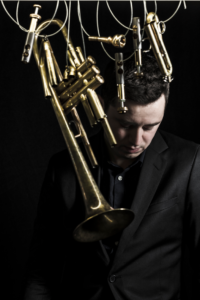 Django d’Or award in 2006, representing Belgium in European Youth Jazz Orchestra in 2007 and being awarded the prix Octaves de la Musique in 2009, Estiévenart impresses people by his keen ability to improvise, his subtlety and energy. Over ten years on the road, Estiévenart has become one of the most in-demand trumpet players today. 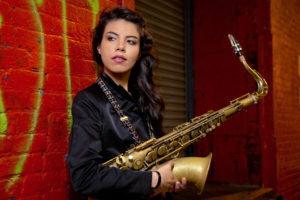 Melissa Aldana, a Chilean sax player with a flawless technique, is not only at her best during her performances of Thelonious Monk’s and Sonny Rollins’, but also when she plays original compositions with a pure jazz touch, especially in the band La Resistencia that also features Sebastian Jordan, well-known among the PaP Jazz audience. Melissa Aldana comes from a renown family of musicians and was awarded the Berklee Presidential Scholarship in 2007. Since then, she’s performed on New-York’s most prestigious stages: Village Vanguard and The Blue Note. A fresh perspective and a sense of performance, a refined and technical feat. Haitian-American singer Malou Beauvoir’s tone is a unique blend of multicultural influences. Her flexible voice accommodates all styles: funk, hip-hop, and she owes her jazz success to her London experience with bass player Jean Chaudron, who spotted the diamond-in-the-rough quality of her jazz tone. James Germain is one of the most important artists on the Haitian scene, a tireless ambassador of his country’s music abroad. He perfectly shows the African identity of the sounds of traditional voodoo, and he thoroughly translates them to modern compositions. For the first time on the PAPJAZZ stage, a unique duo that will take you on an exceptional musical adventure. Veronica Ferreiro is a young Spanish singer and composer, whose first album Laio, is featured in prestigious international record catalogues, such as Dusty Groove America of Chicago and Giant Step in NY. Staying for a long time at Number One of Itunes Spain Jazz Downloads, Veronica Ferreiro has been performing at the greatest jazz Festivals in the world. A deep and warm voice, considered one of the most promising! Not to be missed! 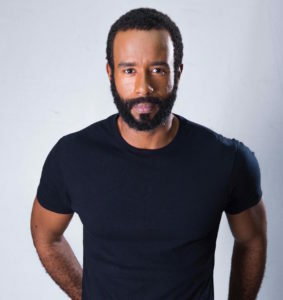 A favorite of the Haitian dance hall scene, singer, songwriter and arranger Mickaël Benjamin (Mikaben) is totally comfortable with compas, zouk and hip-hop, that he sings in French, English, creole and Spanish. A multi-instrumentalist, his reputation spreads beyond borders and Mikaben leaves a distinctive musical print everywhere he goes. A great artist whose inspiration thrives over time. AZ, born in Jérémie, has been passionate about singing since her childhood. In 2013, she joined Haïti en Scène, a performing arts academy until 2015. In 2016, she embarked on a solo career and released her first single “Demen Mwen pwale”. AZ, a promising voice, a merge between bossanova and the Creole pop. Author-composer, the rapper-slameur BIC (his real name Roosevelt Saillant), is a haitian musician well known for his texts. A songwriter who skillfully manipulates a variety of rhythms from the art of rhyme, the poetic melodies to the angry rhythms, it is a successful synthesis between rap and folk. A regular at the most famous clubs like the Pacha in NY or the Ocean Ten in Miami, the guiding thread of Gardy Girault’s work is his love for the Haitian culture, which he brings alive everywhere he plays. DJ composor, he gets his inspiration from profound rhythms like Rara, Rasin or Compas and through his mixes creates a new style: the Raratech and Konpatech. Gardy Girault is one of those gifted individuals for whom everything is music and every music is a melting pot. He’ll be accompanied by his friends, on percussion Youri Vixamar, on vocal and guitar Coralie Herard and Fabienne Violist on violin. For the first time, the festival will host a voodootechjazz evening that promises to radiate electric energy. Ronald Tulle, a composer, arranger and pianist from the Martinique, was given the SACEM Award for “Album of the Year” in 2006. A preferred partner of the French Caribbean music stars, be it in jazz, zouk, and traditional music, he brings a unique sensibility to the tradition of Caribbean jazz. Ronald Tulle forms an incredibly swing duo with Tony Chasseur, a singer also from the Martinique. Tony Chasseur is the voice of such mythical bands as la Perfecta, Malavoi and Sakiyo. He was given the SACEM award for “Author of the Year” in 1992 for his first solo album Itinéraires. Tony Chasseur has an incredible capacity to perform both traditional tunes and jazz standards. Those two amazing Kreyol Jazz talents will be accompanied by one of the best bass players of a generation: Michel Alibo. Michel Alibo is as striking in Funk as in Jazz, in African and in Caribbean music. He usually performs with Rido Bayonne, Manu Dibango, Eddy Louiss as well as with a mythical band of the 90’s: SIXUN. Tony Chasseur and his band are the promise of a beautiful Caribbean evening where Kreyol Jazz will take center stage. 50 years playing the violin, 40 of them with total freedom. Didier Lockwood joined the lyric orchestra of the Calais town theatre (France) when he was 13. If he started with a classical violin training, he veered quite quickly toward jazz and discovered the amplified violin, which became his favorite instrument and made him the international star he is today. 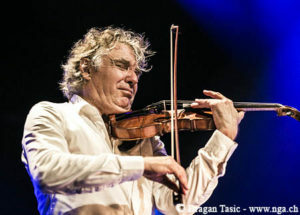 His nervous and powerful style allows Didier Lockwood to explore all of the jazz styles: classic, rock ethnic. His truly personal style is a crowd-pleaser that leaves the audience bewildered by so much virtuosity. Didier Lockwood will be accompanied by a quartet of the well-respected musicians: Paco Séry, Linley Marthe and Olivier Louvel. A closing concert that the Fondation Haiti Jazz is proud to present. 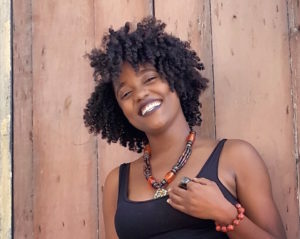 A finalist of the Star Max competition in 2008, Alexa was formed within her neighbourhood’s choirs before taking classes with Bertrand Labarre, founder of Haïti en Scène, in order to become a comedian. 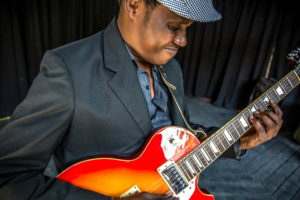 In 2014, Alexa joined Jabadou, Joseph Hans Peters’ band whose other members were Gérald Kébreau and Josué Alexis, among others. It’s in their company that Alexa also participated to the « Caméléon Project », that the PaP Jazz audience could discover last year on the Place Boyer. With her distinctive tone between Soul and Smooth Jazz, it is a fact that Haitian music can rely on this new promising voice for the future. Catts Pressoir Jazz Band has been created in 2013 by Gessoit Pierre Louis with the collaboration of Donaldzie Theodore. The band is made up of 20 students aged between 14 and 16 years from the Catts Pressoir College. Those young students have developed a keen passion for jazz. 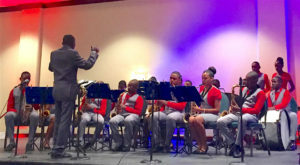 Their common vision is to strengthen jazz music in Haiti by directing young Haitian schoolchildren to jazz and also to play Haitian music in Jazz (kreyol jazz) in order to popularize Haitian music in the world. 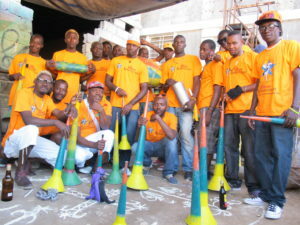 Performing together since 2001, the seventeen musicians that compose the marching-band Follow Jah usually perform in Petion-Ville for Carnival and other traditional and community occasions. Enjoying the support of the Caracoli Association, they are also involved in other activities like education through arts, stage and actions aimed at young audiences. Since 2012, Follow Jah provide evening entertainment during the Port-au-Prince International Jazz Festival. 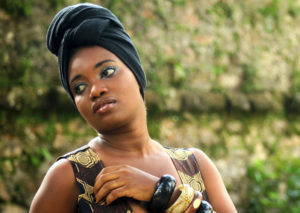 Nina, a young Haitian signer with a dynamic and warm voice who was raised amongst musicians. She can sing from reggae to racine, jazz and blues. She combined great energy and charisma. For the first time at the PAPJAZZ, HD Symphonie group presents its slam show “Ayiticite”, a look at the daily life of Haitians and social reality. The slammers Samuel Emmanuel and Francois Shelo are accompanied by Myson Toussain on drums, Kerby Toussaint guitarist, Jemps Phillias keyboard and Gethce Pierre, singer / guitarist. 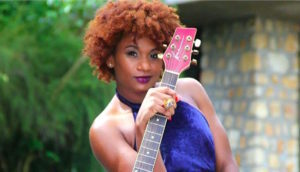 Coralie Hérard, Soul Haitian singer, guitar player and composer, has an outstanding and unique style. She started singing at an early age and later on, decided to learn how to play the guitar. She lived in Ecuador where she attended a private conservatory “Conservatorio de Musica Artes Mozarte”. She cites her Haitian cultural heritage, her diverse musical tastes and her international travels to have major influences on her musical talent. Coralie, with her rich and soulful voice, breaks down the many places and spaces she’s been. Amazan Audoine is a young Haitian trumpet player. Well known in the jazz scene of Haiti particularly at the jam session at the PAPJAZZ. His playing has acquired a certain maturity. Today Amazan presents himself with his friends on the “scène découverte” of the festival. Amazan Audoine Jazz & Family is composed of Caleb Texier on piano, Jude Davens Texier at the drums and Mardochée Williams on electric bass.